9 Knoxville Coca-Cola Bottling Co. Source: Individual company representatives, individual company websites. NA=not applicable or not available. Knoxville area includes: Anderson, Blount, Campbell, Claiborne, Cocke, Grainger, Greene, Hamblen, Hancock, Hawkins, Jefferson, Knox, Loudon, McMinn, Meigs, Monroe, Morgan, Roane, Scott, Sevier and Union counties. 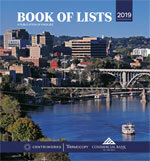 This list and other Knoxville-area market data are available as Excel spreadsheets at knoxvillebookoflists.com. If you notice an error or omission, please contact Hayley Choy at 865-342-6494 or lists@knoxvillebiz.com.